When a home’s roof begins to fail or needs an upgrade, the owners have two choices; a complete mobile home roof replacement or a mobile home roof over. A mobile home roof over involves placing a new roof or roofing material over your existing roof. There’s little to no material removed and that can keep costs down. 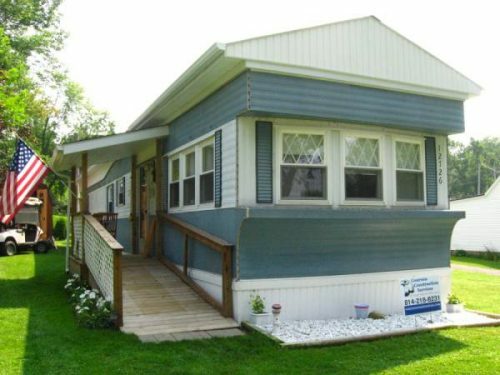 A mobile home roof over creates a unique opportunity to completely change the look of the home. Color, material and even the shape of the roof can be changed when a new roof is installed on an older mobile home. Flat roofs can become pitched and pitched roofs can go higher. 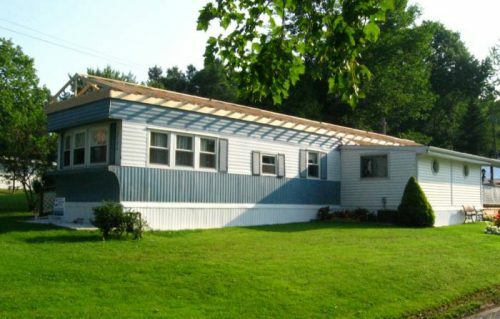 Mobile homes with flat roofs aren’t as popular as they once were. Maintenance is a burden because of the re-coatings required. Flat roofs with no overhang or gutter system create more opportunity for water to damage the exterior walls of the home, too. 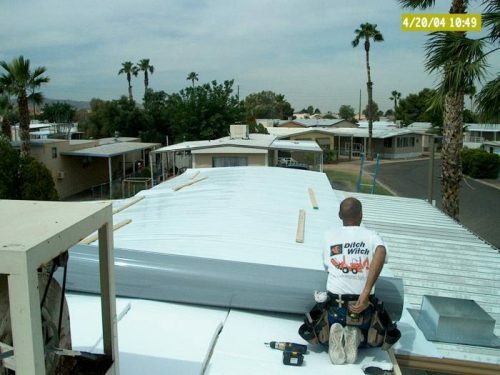 Turning a flat roof into a pitched or peaked roof and adding an overhang is a popular mobile home improvement project. It helps with water runoff and adds value and lifespan to the home. 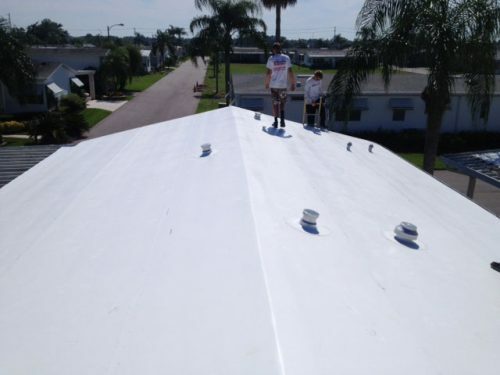 There are a variety of options available that can give your roof the protection and look you desire without the need to remove your existing roof. Mobile home roof overs for flat roofs typically involve metal or rubber or PTO. 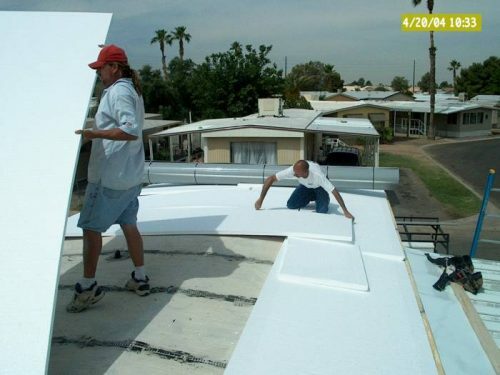 White, single ply TPO membranes are a very popular choice for mobile homes with flat or low slope roofs. 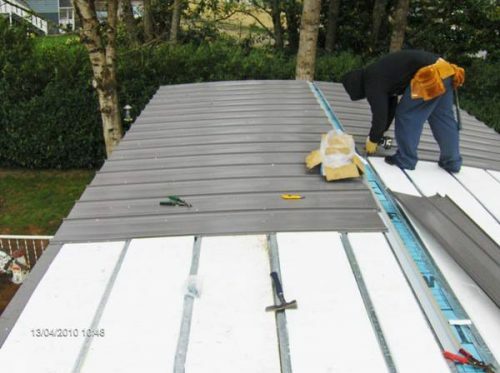 TPO membranes are a polyester reinforced, reflective covering made of a blend of rubber and plastic that can protect your roof from rain and the wind. It can also lower your energy bills by about 30% in a hot climate by reflecting light and heat away from the home. 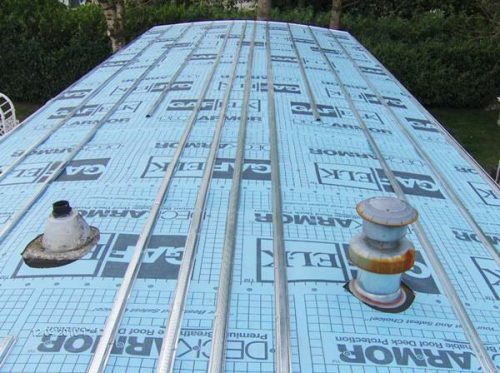 TPO membranes come in several different thicknesses ranging from 45 to 90 millimeters. 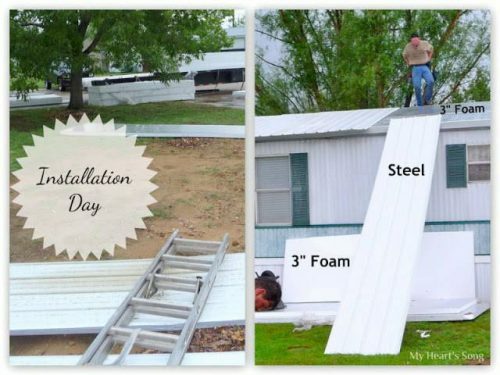 It is a fast and relatively easy installation and often the least expensive option for a mobile home roof over. For those that want a real shingle roof for mobile homes that have a higher pitch or gables, there are roof over options that include shingles. Shingle roof overs are also installed right over your existing roof, as long as you have not already had a roof over previously. One layer of shingles is heavy, two layers may be too much weight for your home’s construction. The subject of whether it’s a good idea to add a second layer of shingles is much debated in the roofing industry. Be sure to get an expert’s opinion before you make a decision. If you’re set on a shingle roof you come in a few different options and styles for roof overs, as well as several different colors and textures. The main benefit to this style of roof over is the appearance, as the shingles can dramatically improve the curb appeal of your property. Installing shingles is typically more costly than a TPO or metal roof but can improve the value of your home helping you recoup the total costs. Installing a new metal roof is the most popular choice for homeowners across the nation. There are many advantages to a metal roof but the 40-60 year lifespan is probably the favorite. Metal is a lighter material than shingles, too. Most metal mobile home roof overs can be installed within one to two days and will improve the look and function of your roof. Adding new insulation and a roof over to your home can increase the energy efficiency of your roof, as well as help to deaden sound while making your mobile home’s climate control easier to maintain year round. Many mobile home owners are beginning to move toward aluminum roofs for their homes. Aluminum, standing seam roofs are extremely durable and can be installed on a number of different roof slopes and types. 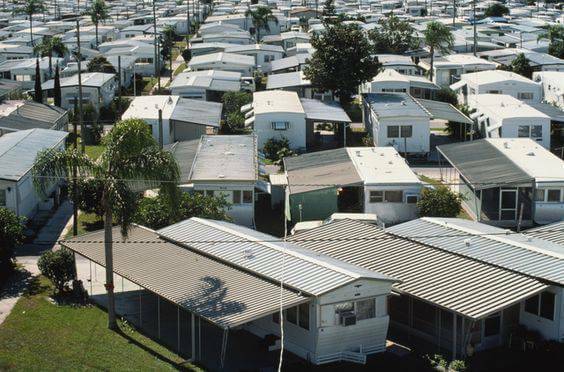 The main benefit to installing a metal roof on your mobile home is the insulation that goes beneath it. A thick layer of foam insulation helps deaden sounds on your roof, greatly reducing the noise that’s common to a mobile home. At the same time, the insulation also helps improve your energy bills, lowering heating bills in the winter and cooling bills in the summer. 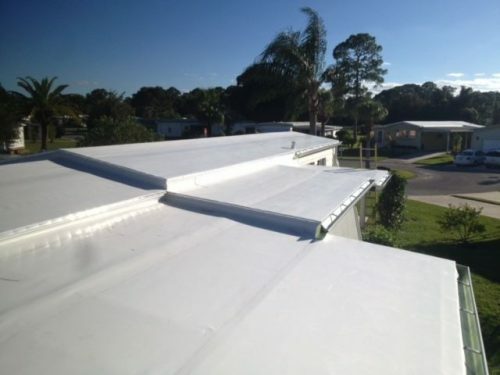 Metal roof overs can be installed over most mobile home roofs . 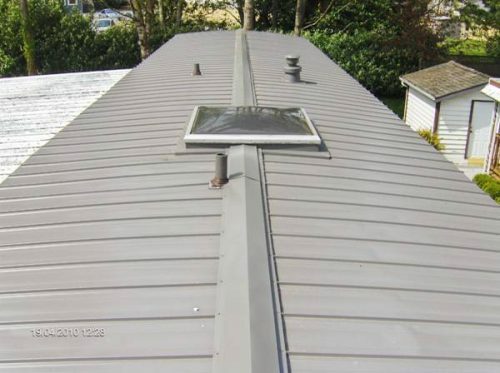 Keep in mind, however, that the insulating layer of a metal roof does increase the thickness of the roof by several inches, which in turn, will increase the height of your mobile home. Always check your local code requirements and association guidelines if your home is in a park or other area where things like height or uniformity of the properties may be in question. Metal roofs may also be more costly than other options, however, they do tend to last the longest and require the least amount of maintenance in the long run. I wrote an article for About.com that went over the three main types of flat mobile home roofs here. 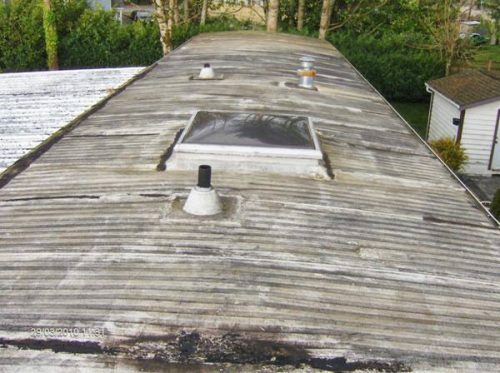 If the roof on your mobile home is beginning to show its age, consider correcting the problem with a roof over. 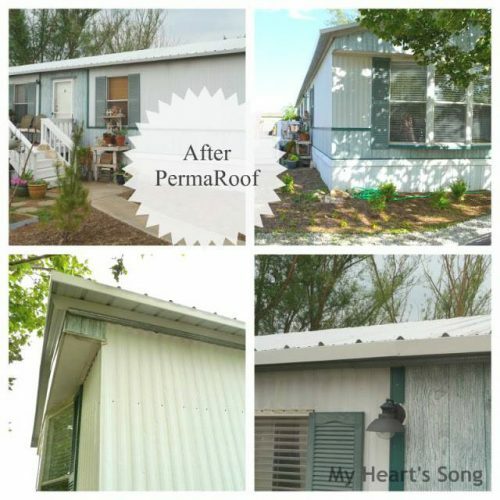 Less invasive and expensive than a complete re-roofing, mobile home roof overs can dramatically increase the curb appeal, function, and comfort of your home. I’m sure you can but the profile and condition of the metal are going to determine how one would go about it. Layers are usually a good thing but you still need ventilation and when you start adding a material over another material you often lose venting and can create moisture issues. You’ll need to pro to take a look at it. Unfortunately, I can’t give you a price because I’ve learned that things are a lot more expensive on the west coast than they are in WV and SC. We put a flat metal roof over the original flat rook of our 1978 single wide 9 years ago and haven’t a single issue and we get quite a bit of snow. Flat roofs aren’t completely flat and that allows water and ice to slide off easier. Installing a new roof with siding is the best idea. That way you can create a sufficient design to keep water from getting behind the siding (whether you use gutters or drip guards, etc.).. It’s a standing seam and has one side raised up just a tad to help runoff. The previous owners had installed it themselves. From what I’ve been told standing seam is the better product but it’s more expensive to buy and install. Since the seam where each panel meets is raised up and interlocking -as opposed to just sitting on top of each other) it removes the chance of water pooling over it and possibly leaking. I think the design makes the entire roof act as a single unit so it’s stronger and sturdier too. If you don’t have snow or a whole lot of high wind and rain you should be able to get by with the regular metal roofs. I have a brown single wide that I am renovating. A pitched metal roof is the first remodel….I wanted black because I want the trailer to blend into the surrounding 86 areas secluded area but I have heard that black will be way too hot in the summer, I live in Cadillac, MI. Is this true? It is true that black hold more than other colors. That’s why black cars in the south aren’t as popular as in the north but you be should be fine in MI. I’m thinking you may want to go with black because it may help melt snow off your roof in the winters. I don’t know if there’s any scientific data behind that but every bit of heat retention can help. I am a big fan of black roof. I think it grounds a home and like you said, blends well into most environments. Thanks for reading! We did a metal roof over the original roof. That has helped our heating and cooling so much! We did learn a very valuable lesson though, a few years later. Our original gutters were left on, but the overhang from the new roof did not line up properly with the gutters. I wish we knew to replace them at the same time, but the contractor only mentioned it as a “hey you should do this at some point” after the fact. Please learn from our mistake, and look into gutters at the same time as a roof over. It will save a lot of damage later. Thank you so much for the tip, Shell! It’s things like this that can really help other homeowners. I know gutters are important but they are a lot of trouble with ice and snow. Thank you so much!!! My sister needs to have her double-wide reroofed. The house has regular shingles now. She’s looking at getting architectural shingles, but I pause. > Because mobile home roofs have such a slight pitch and architectural shingles have more nooks and crannies (than regular shingles) does that become a problem with accommodating runoff of rainwater? In other words, is trapped rainwater a problem with architectural shingles on mildly-sloped roofs? I am not a roofer and I tried to email the one I know but never received a reply. I know this isn’t an answer but every model is different and some can absolutely withstand the really fancy shingles without additional support while other models will need reinforcement. The pitch of roofs on manufactured homes is enough to shed water properly assuming there are no valleys. 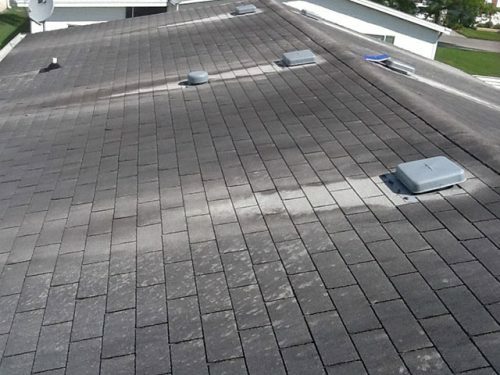 Even with valleys, a correctly installed roof should shed water easily. I’m a HUGE fan of metal roofing that just goes over the old shingles. If done properly (and that’s the most important part), metal can last much longer than shingles and typically costs less. You also don’t have to remove the original shingles so you have less waste, less manual labor costs, and more R-value. I would like to know about TPO for my double wide mobile home. I have checked this site several times and there is nothing about cost or where to purchase or a contractor. I called a contractor and a mobile home supply and both did not know what I was talking about. My home is an older home, about 22 years, has a single roof which had a foam put over the singles and a coating when I purchased the home. I had another coating put on but the birds have pecked holes in the foam and I want something that will not have this problem with constant repair and having to have that coating put on. Is TPO the way I should go. I am a senior and do not want the expense of repairs and having to have that coating put every two years as recommended. Every contractor is different and based on location even installation can vary. You will need to do Google searches to find a local contractor. Use variations as you search because Google is finicky with some topics (roofing and siding materials seems to be one of those topics). Only 1/2 my roof is having an issue with water dripping. It was recently rerolled because we thought it was leaking from the rain. It’s hasn’t rained but still drips so we assume it’s from condensation & has caused damage to some ceiling panels. Any suggestions & could we only repair the 1/2 we’re having problems with? You can fix only one half. It’s not a problem at all. That half of the home probably needs a pro to determine if it needs to be vented or better insulated (Condensation in ceilings is WAY over my head – I don’t really understand the science behind it). You may want to make sure the water lines have not been routed overhead for some reason, too (never hurts to check – some people do it). I’m not familiar with pool enclosures at all so I can’t really help you with that questions. I did Google it and here are the results I found: click here. Sorry, I can’t help! Best of luck! Thank you so much Kit! I’m very thankful for all the readers that have looked over my many, many grammatical errors and still supported me! I still pinch myself regularly to make sure it’s all real!